This inquiry into religion is one of the novel’s main themes. Isa’s mother believes everything happens for a reason. Isa is more sceptical. “Resorting to faith,” he dryly observes, “by its very nature, requires faith.” But he has plenty himself, and it thrives on varied food – in a Buddhist temple, through his aunt’s Catholicism, or in a felt, not learned appreciation of Islam. All this is handled subtly and generously, culminating in a Sufistic focus on the heart. Isa’s father was killed by the Iraqi occupation, but his promise – to bring his son back to Kuwait – is fulfilled nevertheless. Kuwait was the dream of Isa’s Filipino childhood. Transplanted now in his father’s home he puts down roots in a precarious space, somewhere between his relatives and the domestic servants. For his Kuwaiti family, class and racial prejudices make Isa more of a dilemma, and a potential source of shame, than a celebrated long-lost son. Another, equally memorable character set plays out the drama of gossip and suspicion – the human rights activist aunt, the good-hearted half-sister, a grandmother whose cantankerous style matches the Filipino grandfather. It makes for funny as well as uncomfortable reading. It’s a measure of its success that, despite the honest analysis of their faults, the reader feels great sympathy for the Kuwaitis, who are never anything worse than victims of a social system. And there’s a great deal in them to love – the ‘craziness’ that Isa adores, their clapping and dancing, the warm solidarity of their diwaniya gatherings. Alsanousi is keen to stress Kuwaiti as much as Filipino diversity, the enormous physical and cultural range even in a country that can be crossed in half an hour. And the text is playful enough, sufficiently confident, to turn such tricks as a walk-on role for Ismail Fahd Ismail, the real-life father of the Kuwaiti novel. 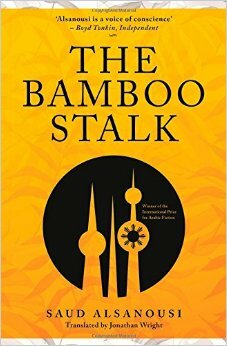 If “The Bamboo Stalk” is an inquiry into personal, national and spiritual identity, it’s a coming of age novel too. As such, it depicts its protagonist’s journey towards a mature self-knowledge. And as surely as José/Isa achieves this, so too does Kuwait, and the Gulf in general, through Alsanousi’s writing. The multicultural but semi-segregated Gulf has long constituted a cosmopolis in denial. Now, in this truly cosmopolitan and deeply humane novel, it has found a voice and a mirror.